Bridgeport, CT ... The Art Department of Housatonic Community College in collaboration with the Housatonic Museum of Art presents renowned pastel artist, Clayton Buchanan to speak in Room #514, the Event Center of Beacon Hall, 900 Lafayette Blvd, Bridgeport, CT on Monday, March 31, 2014, 5 – 7 pm, free and open to the public. Buchanan will talk about his formative years as an art student, and his career that has included commercial illustration and advertising, involvement with art galleries, commissioned portraiture, and ongoing demonstrations, workshops and classes. In his talk, Buchanan will share images of his works along with technical information about his artistic practice. Visit www.housatonic.edu for further information or call (203) 332-5116. 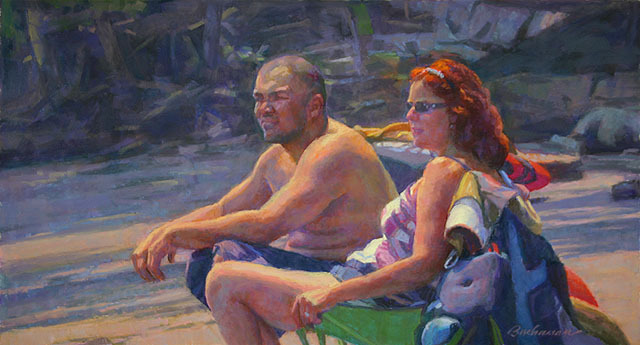 Clayton Buchanan is the recipient of numerous awards including the F. Luis Mora Award for Pastel, Kent Art Association President Show, 2013; CPS Member Award, Renaissance in Pastel National Juried Show, 2013; Best in Show, Kent Art Association Spring Juried Show, 2012; CPS Honor Award, Connecticut Pastel Society Annual Member Show, 2012; Edmond Tarbell Award, Guild of Boston Artists Annual Member Show, 2012; Best in Show, Connecticut Pastel Society Annual Member Show, 2011. Mr. Buchanan was awarded two Elizabeth T. Greenshield Memorial Foundation Grants. His works are in private and corporate collections including The First National Bank of Boston, London, England and the Elizabeth T. Greenshields Memorial Foundation, Montreal, Canada. Buchanan has completed private portrait commissions nationally. A tremendous asset for students at HCC is The Housatonic Museum of Art’s collection contains over 5000 works of art spanning ancient through modern times and is one of the largest permanent collections of any two-year college in the Northeast. Exhibition and programs are funded in part by the Werth Family Foundation, Institute of Museum and Library Services, Connecticut Commission on Culture and Tourism, Fairfield County Community Foundation, Target, Housatonic Community College Foundation, and other individual donors. If you are interested in supporting HMA exhibitions and programs by donating to the Housatonic Community College Foundation, contact the Museum at www.HousatonicMuseum.org.